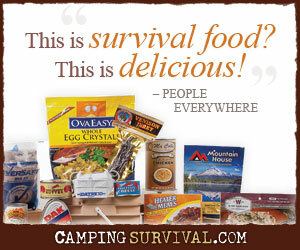 The thing that I most enjoy about the prepper community is the people. Sure you can learn a lot from web sites like this one and others, but in the end it’s the people I get to meet and occasionally talk with that make it engaging for me. Recently I had an opportunity to spend time with Jarhead Survivor of SHTFBlog fame. We talked about prepping and sharing his experiences with others. Here’s what he had to say. Joe: Hi Jarhead. Thank you so much for spending some time with me today. JS: Hi Joe. It’s a pleasure talking with you. Joe: I have followed your blog (SHTFBlog.com) for a couple of years now and I’ve learned quite a bit from your posts. You have a good, common sense approach to prepping. Why did you begin prepping? Was there a watershed moment when you recognized that you and your family needed to be better prepared? JS: Thanks. I really started thinking about prepping shortly after Y2K. I didn’t actually believe anything was going to come of that event, but news stories at the time got me thinking about how fragile our society really is. We’re so dependent on the energy grid that if we lost it for an extended period of time we’d be in big trouble as a nation. I think a lot of people have lost touch with the concept of “roughing it.” Today, roughing it means you’ve got to sit on those hot leather seats in your car before the AC kicks in and cools them down. I grew up in Maine and most people who have lived here all their lives are used to losing the power at least once or twice a year and know enough to have some kind of back up. Not everybody of course, but that’s the kind of mentality I grew up with. Growing up we heated with wood, so when the power went out we just got out the Coleman lanterns and it was pretty much business as usual – minus the 13 channels we got on tv at the time. The watershed moment for me was probably when the market tanked a few years ago and I saw how dependent we are on these esoteric systems. I’d been prepping before then, but that really got my attention. Joe: Given your moniker and what I’ve read in some of your posts, I know that you’ve spent some time in the military, the Marines specifically. I wonder, how did that influence your prepping? Obviously you learned some survival skills and confidence while serving in the military. But how has it changed your thinking and how you prepare? JS: I suppose I actually got into prepping because of my interest in outdoor survival. Prepping and outdoor survival go hand in hand and when I first started writing it was mostly oriented around the outdoor aspect. The military gave me some survival training and it pretty much fell in line with stuff I’d learned growing up. After I got out of the Corps I started reading a lot about different kinds of traps and snares, purifying water, what you can eat in the woods in my area, making cordage, building shelters, the survival rule of 3’s (or 6’s depending on who you talk to) and that kind of thing. To me that was fun stuff and I didn’t really equate it with prepping until later. It was just stuff I enjoyed doing. Joe: At some point after you became aware of the need to prepare, you decided to share what you’ve learned with others through SHTFBlog.com. What led to that? How did you begin blogging? JS: As you probably know when you first get into prepping there’s that, “HOLY COW!” phase, where your realize that TS could HTF any minute and you don’t have three cans of soup in your pantry. I hit that phase years back and once I had a little food and water stored I dug deeper as everybody does, then I just decided to start writing about my experience on my own blg. About that time I found SHTFblog and really like Ranger Man’s style. Plus he was a homeboy from right here in Maine. I commented a few times on his blog and he came over and checked out my writing and proposed that we team up. We met face to face a few times to talk about it – turns out we we’re both from the same home town, but live in different areas now – and it seemed like a good fit. He’s a really cool guy with a fairly hands-off approach, but he does expect some effort and he’s called me a on a couple of my poorer articles. Never in a bad way, just kind of, “What do you suppose the reader took away from this?” That kind of thing. Joe: Prepping, and the notion of being prepared for an uncertain future, seems to have really taken off over the past few years. Do you think that people really are more aware of a need for prepping than they were before? Or has the need remained about the same, but it’s starting to catch more media attention for some reason? JS: I’ve wondered that myself. I think the media caught wind of the movement, which signifies that people have been aware that there could be trouble ahead, and started reporting on all those goofy people buying crazy amounts of groceries and storing them away. People watch the shows and a percentage of those say, “Hey! I think those folks are on to something.” So I guess it’s a circular self-feeding kind of thing. Joe: A couple of the cable channels have created shows about prepping. Do you think that the notoriety this brings to the movement helps spread the message? Or does it dilute it to some extent, pushing preppers into the category of crackpots with tin foil hats? JS: Both, I think. It definitely casts those who prep in a less than a flattering light, but again, it gets people out there thinking that maybe they should have more than a days food stored away. Personally, I don’t like those shows and don’t watch them, but so many people get their information through television I can understand why the networks are eager to get these shows out there. Unfortunately, in order for people to watch they have to put some kind of controversy or craziness in the show to entice the average viewer in. Nothing better than a crazy redneck hillbilly running around their property at night with night vision and an AR-15 shooting at things to get people watching. Joe: There seems to be a bit of a debate in the proper community about whether it’s better to have a good “bug out location” and transportation to get there or whether you should attempt to hunker down in your current location, effectively making your home your bug out location. Where you stand on that? JS: I personally live in my bug-out location. My home is situated in a big forest, but close enough to town that we could walk there if we have to. I have several farms around me and I have a small vegetable garden in addition to my food and water preps. However, I’ve done mental exercises of various places to bug-out to if that ever became a necessity. What that would be, I can’t imagine, but they’re called emergencies for a good reason right? You never know what you’re going to be handed, so you’d better have a plan written down or in your head, because if something happens you won’t have to try to make decisions on what to do while you’re under pressure. You can just grab your family and your gear and bug-out! Joe: Many who have chosen to live in their “bug out location” have also chosen to return to a simpler lifestyle. I guess you could call them homesteading preppers. They are interested in traditional skills like gardening, canning, and soap making, for example. Others focus on primitive survival skills like making snares and building debris huts. And still others focus on operational security and defending the supplies they’ve stockpile from those who will seek to take it. Laura and I tend to focus on all three, believing that they are all different facets of the same thing – being prepared. What do you think? JS: That’s one of the biggest reasons I like your blog. You guys don’t just talk about it – you live it. That kind of authenticity counts for a lot these days. Instead of writing primarily “scare” articles you two write about a huge variety of things from “Mice are not nice” – which is one of my favorite articles by Laura. I like your “Survival Myths” series because I’ve run into the same things myself over the years and it makes me want to pull my hair out. Joe: Thanks, Jarhead. It’s definitely a lifestyle choice that we’ve made for ourselves and enjoy. For the new prepper, the one who has just recognized that he is woefully underprepared for even the most modest of trials and is right in the midst of the “Holy Cow!” moment you mentioned a minute ago, what advice would you offer? For example: I’ve got four people in my family and I live in a forest in Maine. I want to store three months of food and I have X dollars of money per month left over to spend on extra food. How much do I need to buy per week/month to meet my goal? As opposed to: I live in the middle of a city in a small apartment and I’m married with a two year old girl. If TSHTF what am I going to do? Planning is everything. Lay out a plan and once you’ve crunched the numbers get started. Joe: Right, the cure for worry is planning as they say. Recently, you and your partner in SHTFBlog.com, Ranger Man, added another regular writer, Calamity Jane. I’ve enjoyed reading her posts as well. What prompted the new addition? JS: A couple of things actually. First, I was writing three posts a week, which is a lot of writing. Top that off with a (then) two year old boy and a newborn daughter and you’ve got the right recipe for burnout. I talked with Ranger Man and then we looked around and he said Calamity Jane would make a nice addition to the SHTFblog family. Not to sound sexist, but she brings a softer touch to the blog and writes about things that Ranger Man and I normally wouldn’t. That and the fact that I only have to write two posts per week now makes her an extremely welcome addition. She lives in Idaho, so I’ve never actually met her face to face, but we’ve chatted via the internet a few times and she’s a very smart and nice lady. Plus, she just had a child of her own recently, so I *know* she’s busy! Joe: Yes we do. We’re expecting another child most any day now. We’ll let everyone know when the big day arrives. Thank you, Jarhead, for spending time with me today. I know you’re busy with all of the different activities in your life. Is there anything else that we didn’t discuss that you’d like to mentioned before we end? JS: I don’t think so. Keep up the good work on your blog and talk to you later. I really appreciate the time that Jarhead Survivor spent with me. He’s a quality guy, through and through. If you haven’t already done so, I encourage you to head on over to SHTFBlog.com. He’s got a great down-to-earth and conversational writing style that is relevant, informative, and entertaining. ← Are You Eating as Healthy as You Think?